A traditional Shinto wedding I captured walking through a temple in Tokyo, Japan. Generations of tradition here. There is very little Carl Sagan did not speak or write about with clarity. His desire for understanding and ability to distill broad concepts for all ears make him an invaluable voice, especially today. Now compare that with another reality, one in which the external changes, social or biological or climatic or whatever we wish, are rapid compared to a human generation time. Then parental wisdom may not be relevant to present circumstances. Then what we ourselves were taught and learned as youngsters may have dubious relevance to the circumstances of the day. Then there is a kind of intergenerational conflict, and that conflict is not restricted to intergeneration but is also intragenerational, internally, because the part of us that was trained twenty years ago, let's say, must be in some conflict with the part of us that is trying to deal with the difficulties of today." If you are like me, your reality is described in Sagan's second paragraph, one in which external changes rapidly alter the framework of culture, career, and family. If you are a teacher or mentor to any young person, you will feel the friction of generational gaps, accelerated by the technology that appears to engulf our children. If you are a child or were one in the last 20 years, you are more than aware of the worn-out warnings of the pace of our current age in the Western world. You may roll your eyes, sigh in agreement, or do a little of both. After all, we're here now, and there is no going backward. In the shifting planes of modern day existence, what role do oral and written history play? What can we stand to learn from that past? 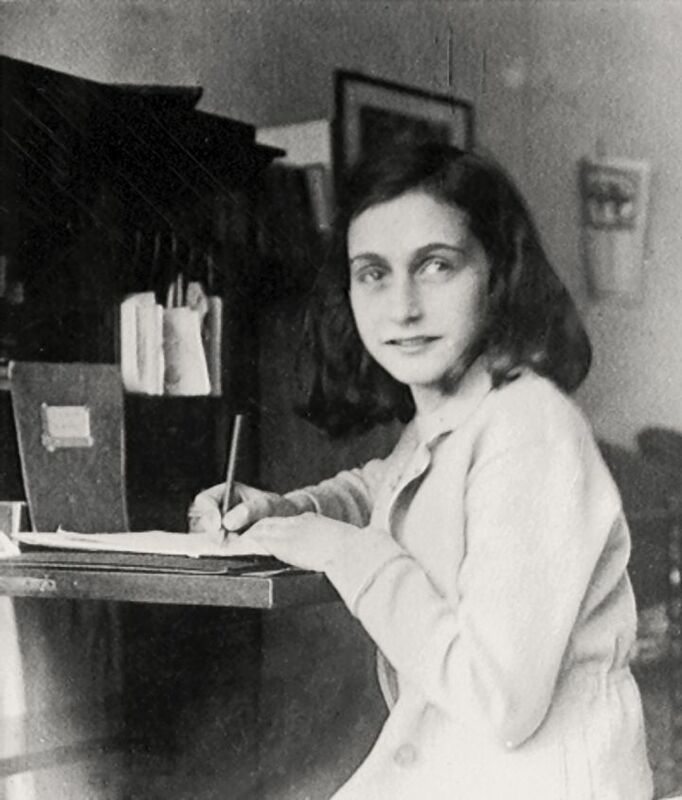 A photo of Anne writing at her desk at home at the Merwedeplein, 1941. Enter a fifth grade classroom, c. 2002. Students are reading The Diary of Anne Frank. American schools teach about the Holocaust to children from grades 3 and up, as far as I can recall. And good thing, too. As a book lover, the stories of Misty of Chincoteague and The Island of Blue Dolphins were compelling to me; surely they taught us about indigenous culture, protecting the environment, and empathy. But nothing would move me the way Anne Frank first did in that classroom. "Large numbers can feel cold and distant and even kind of comforting, because they don't feel like people. And I think that's one of the reasons much of the world was able to ignore the years' old Syrian refugee crisis until recently. But then after thousands of refugees died trying to get to Europe, one three-year-old boy's body washed ashore in Turkey...To talk about the refugee crisis, we need statistics. But let us not forget what is precious." I don't think anyone can forget that photo of Alan Kurdi or the media response to it in the following days. Why all the heaviness? Why the thoughts of war's effects today? (It is the Super Bowl after all. Alas...) It could be that it is winter. It could be the news cycle. But today, I ran in the Run for Refugees 5k in New Haven, CT, so refugees and their needs are on my mind. If you're a runner, you know how joyful and even emotional races can be. The surge of running with a large crowd is motivating and rewarding. I felt especially emotional as I rounded the second mile marker and saw a sign put out by the sponsor, with this: ">50% of all refugees are children". There was Anne Frank again, and Alan Kurdi. My sense of responsibility and empathy was immediate. We have to be doing better for those who flee conflict. Events like this help raise awareness and money for important causes. it was my second year at the event, which I found out about through a friend who works at IRIS, the Integrated Refugee and Immigrant Services established in New Haven. The organization helps to resettle and integrate families throughout Connecticut. Their mission something I feel strongly about, and though I know my donations help, I can't help but feel I could be doing more. Our system feels under supported and broken, though the need is great. We have always been a nation of immigrants and refugees. If any family goes back far enough in their past, they will find a scenario of struggle and distress. You can be a 7th generation American-born whose ancestors escaped prosecution in Europe. You could be a third generation Italian-American whose grandparent fled armed conflict, like myself. If we want to unearth an even more horrific story, we can look at the indigenous peoples of our country, or the descendants of slaves brought here at the dawn of our nation. But as I have no family history in either lineage, I do not feel qualified speaking for them (nor is immigration and forced enslavement and genocide comparable in my mind). In this audio clip I recorded as a teenager, my nonno recalls his mother saving his small town on the Istrian peninsula. He spoke fondly of her often; telling us how she spoke four languages: Italian, Serbo-Croatian, Hungarian, and German. The familial theme continues from two weeks ago. I think to my grandparents, and more specifically, my grandfather this time. He was a difficult man to get along with, but he was my family and I loved him. He grew up in a placed called Istria, a peninsula that was then part of Italy, then Yugoslavia, and is now part of Croatia. I'm committed to learning more about this region to discover my roots but for now all I have is the oral history I recorded from my nonno and articles such as this. Due to the ethnic conflicts of the Post WWII era which I can't discuss at length, he was forced to fight and then fled, leaving his homeland and coming to the U.S. as a young, 17 year old immigrant. Today, I would call him a refugee. What did I learn from him? In my reality, which resembles his only in the blood we share, how do I tap into his wisdom? As Sagan noted, there is conflict in these intergenerational relationships. And, being one who does anything to avoid conflict, I didn't enter into a conversation with him as much as I absorbed what he, and my nonna told me. The act of their storytelling became almost sacred to me. I would carry my journal with me to the glass table at Sunday dinner, and hide my camera next to the crystal glasses to record and capture their lives. I learned that in the 40's a subway ride and a Mars bar cost a nickel. When my nonna spent her pocket money on the latter she had to run all the way home to make it there before dark, foregoing the subway ride. I learned that an Italian immigrant with no English could work sweeping a factory floor and live in a flat for dollars a month. I learned that the hairstyle for girls those days was curls, and my great-grandmother would tie her daughter's hair in rags every night. I learned that John Wayne, who frequented the famous restaurant Danny's Hideaway where my nonno was a host, once drank 13 sidecars in one night. What did I learn that I can use in my reality? As it turns out, those rich stories don't have any direct effect on my life. They fill the reservoirs of memory, but they don't hold special meaning outside of my family. And in every family, you can trace the same pattern. I know some folks who take no interest in this history, nor any storytelling, art, writing, or film of the past. While I try hard not to impart judgment on another's values, I can't help but feel remorse over this. Though we may find tragedy and pain in the collective history of our families and cultures, we also find a tapestry of identity. The narratives of the past inform our own paths and interests we cultivate, as I stated in my last post about the trans-generational love of music. We have, each of us, a life-story, an inner narrative — whose continuity, whose sense, is our lives. It might be said that each of us constructs and lives, a “narrative,” and that this narrative is us, our identities. If we wish to know about a man, we ask “what is his story — his real, inmost story?” — for each of us is a biography, a story. Each of us is a singular narrative, which is constructed, continually, unconsciously, by, through, and in us — through our perceptions, our feelings, our thoughts, our actions; and, not least, our discourse, our spoken narrations. Biologically, physiologically, we are not so different from each other; historically, as narratives — we are each of us unique. And those of us who find value in these narratives, in these identities of others, find ways to prop up their importance. Who would I be as a person unless someone had found worth in the words of a young, Jewish girl living in hiding? Where would we be as a nation without the millions of narratives of immigrants who shape our country? Artists, historians, writers, filmmakers--- they transform these observations, similar to the ones I experiences at the dinner table, into works of art. Tony Gatliff, in his musical documentation/dramatization of the path of Romany migration from Rajahstan through Europe, (named Latcho Drom) demonstrated the vivid, raw musical culture of the Romany people whose adaption to each landscape is tangible and breathtaking. A 2012 painting I did of some members of the Fermeglia clan. What we find in this movie (available in 10 parts on youtube; I would highly recommend it), is the connectivity and power of music. The use of music in nomadic culture can remind us of our own roots. We need not go back very far in human history before agriculture was not yet dominant and people passed down wisdom through storytelling and music. I like to think about this intergenerational identity and wisdom when it appears that time is moving too rapidly for me to catch up. I like to explore books that deal with cultural anthropology, to find some traces of my own humanity in foreign corners. I revisit my observations of my grandparents and ask my parents about the past. I create artwork and write poetry that explore storytelling and our collective history. I find value in these things. I see how easily life is uprooted and forced into hostile soil or snuffed out entirely. I won't take these elders and their wisdom for granted, even if their experience will never be my own. What wisdom do you find in others' stories?